Artwork of a Coin Coffer from Super Mario 3D Land. 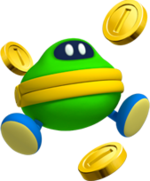 Coin Coffers are enemies that first debut in Super Mario 3D Land. They have small eyes on top of their head, are round, have a light green color, have wide yellow-lipped mouths, and slightly resemble both coin purses and frogs. Their name is a pun on "coffer," which is a name for a container used for storing money or valuables, and "cougher," referring to how coins come from their mouths. Coin Coffers react similar to the Moneybags as they attempt to run away from the player. In Super Mario 3D Land, they contain ten coins. Hitting a Coin Coffer in any way causes it to drop a coin, dazing it, and after five hits, it spits out the rest of the coins it contains before it is defeated. Ground Pounding one causes it to spit out all of its coins before being defeated. When hit by Invincible Mario, its ten coins are dropped in a ring shape. Coin Coffers first appear out in the open in World 2-3. Some Coin Coffers are hidden under stones and bushes, like one in World 2-1 and two in World 4-1. Coin Coffers reappear in New Super Mario Bros. 2, acting similarly to how they did in Super Mario 3D Land. They appear sometimes after activating a Red Coin Ring too, dropping eight Red Coins as it bounces. If Mario defeats it before it can release all the Red Coins, they will all be dropped. They only appear in World Star -1 and World Star -7, as well as several DLC courses. Coin Coffers reappear in Super Mario 3D World. They act the same as how they do in Super Mario 3D Land. However, they are now invisible and hide in certain hidden areas of levels. They can be made slightly visible by touching them on the GamePad, and jumping on them will fully reveal them. A Coin Coffer captured by Mario as seen in Super Mario Odyssey. Coin Coffers return in Super Mario Odyssey where they appear in the Wooded Kingdom and Sand Kingdom. They retain their invisible ability from Super Mario 3D World. When they are visible to the player, Mario is able to capture one using Cappy. When a Coin Coffer is captured, they act like ? Boxes when running around or while standing still. Mario is also capable of standing on steep slopes when capturing a Coin Coffer. The player can also choose to spit out Coins which act as projectiles, which also depletes their amount. If the player shakes the Joy Con, the Coin Coffer spits 20 coins around it in a circle. In this game, Coin Coffers are absolutely harmless towards Mario, as running into one will not damage him; despite this, they still seem to be considered an enemy, as taking a captured Coin Coffer near NPCs will cause them to react in fear. Coin Coffers reappear as enemies and potential allies in Puzzle & Dragons: Super Mario Bros. Edition. They come in green, red, blue, yellow, and purple colors, which represent which attribute they have; fire for red, water for blue, wood for green, light for yellow, and dark for purple. Unlike most enemies, the Coin Coffer has a very high defense, which normally reduces any damage that it takes from a single attack to 1, but its HP is very low. Its attacks are also very weak, and it might run away from a battle. Defeating a Coin Coffer with a 10+ combo guarantees that it'll join the player's party. Otherwise, it'll only have a chance of joining the player when defeated. All Coin Coffers have a Skill, Coin Boost, that doubles the amount of coins won during a single battle. Also, they're unique in that level 1 is their maximum level. Coin Coffer allies can give party members a significant amount of experience points whenever they're used to power them up, which can be handy for leveling up lower-leveled characters. The player can also transform the Coin Coffers into a new variant of Coin Coffers, called King Coin Coffers by giving them six Super Mushrooms. A Coin Coffer, found in World 4-3, in Super Mario 3D Land. A Coin Coffer, in New Super Mario Bros. 2. A Coin Coffer model from New Super Mario Bros. 2. Coin Coffer Prima artwork from Super Mario 3D World. A Purple Coin Coffer, from Puzzle & Dragons: Super Mario Bros. Edition. A Coin Coffer from Super Mario Odyssey. Gamanē is a portmanteau of the Japanese words gama (toad) and manē (transliteration of "money") or okane (money). French Crapognon From crapaud (toad) and pognon (cash). Donkkeobi Portmanteau of "돈" (don / money) and "두꺼비" (dukkeobi / toad). This page was last edited on March 2, 2019, at 20:13.